I’m guessing there’s going to be lots of milk bought this week with it being on sale at lots of places! Want to put the rest of your sale prices to good work? Try this week’s menu! Baked Potato Soup – I’m one of those people that think soup is an all-year kind of food. Especially this one that uses milk as a main ingredient! English Muffin Pizzas – Hy-Vee has these on sale, but think outside of breakfast. Put some pizza sauce, pepperoni or ground beef and cheese on English muffins. Just bake them for 10-15 minutes and you have little pizzas! Cheeseburgers – Might seem kind of boring, but let’s not lose sight of the fact that school is about to go back into session – let’s take advantage of summer while we got it! Grilled Pork Chops – this is the only way that I make pork chops. This isn’t the Shake N Bake that you might have had as a kid – it’s even easier! One Pot Mexican Skillet Pasta – With ground turkey on sale, maybe experiment using turkey instead of beef in some recipes. For this recipe, she started with turkey and it looks easy and wonderful! 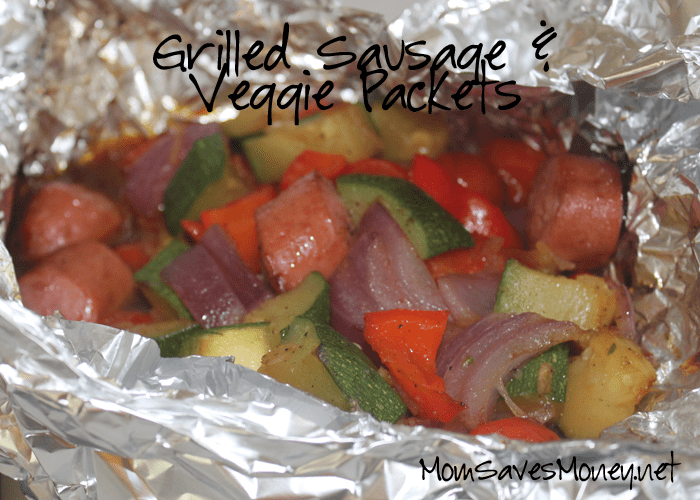 I said last week that I wanted to try these Sausage & Veggie Packets since smoked sausage was on sale. I tried them. I LOVE THEM! I made it a little different than the original recipe, but that’s simply because I chose veggies that I like more or that I had on hand. You can mix and match as well. We will definitely make this again! They say that it feeds 4 people, but I think it’s more like 3, so definitely double it if you’re feeding a large family. I prepped my packets in the middle of the afternoon, then grilled them a few hours later. It made dinner prep super easy! In a large bowl, combine all the ingredients. Divide between two pieces of double-layered heavy-duty foil (about 12-in. square). Fold foil around sausage mixture and seal tightly. Grill, covered, over medium heat for 25-30 minutes or until the vegetables are tender. Open foil carefully to allow steam to escape.